You wake up in the morning, sleepily go through your routine ending with the OROGOLD’s 24K Deep Day Moisturizing Cream, and begin to apply your make up. What is the first thing you pick up? Since most of us are not blessed with absolutely flawless skin, it is probably a foundation. This base coat can make or break the rest of your look. You do not want your foundation to look like a second skin, you want it to look like your actual skin. There is nothing attractive about clown face, when you can see the distinct line between foundation and skin. To get the most benefits from your foundation, you have to choose the right shade and the right type of foundation. Have you ever picked out a color of paint in the store, brought it home and realized that it is the wrong color? Buying foundation can be a lot like the paint can experience. If you can, test out the shade on your face at the makeup counter, it is the only real way of knowing whether or not you have found a match. If you apply the shade in one area and cannot detect an outline, you have found the right one. If you are unable to sample the shade, study the natural color of your skin. Do not try to lighten or darken your skin with a foundation. Different brands divide colors differently, some simply by shade and some new beauty products divide by shade that is then divided into warm, neutral, and cool colors. Try to find the color that most closely matches your skin. Foundation has evolved way paste the pancake makeup used for the stage. 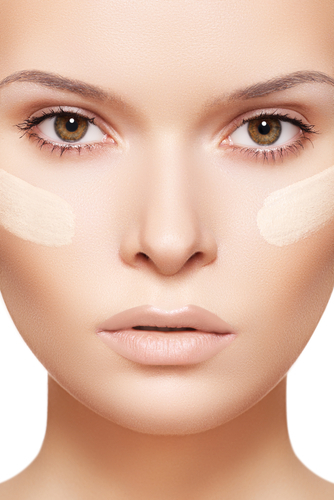 Foundations can be light and airy, can offer extra blemish coverage, and moisturize. You simply need to find the foundation that works well for your skin. This type is still the most popular form of foundation. It is easy to apply and is formulated to suit the needs of many different skin types. Water based products are ideal for people with oily skin, and oil based products give dry skin a boost. Apply liquid foundation from the bottle with a makeup sponge to give skin an all over, smooth look. This type of foundation is sold in compact form. It goes on like a liquid and then dries for a powder finish. The powder finish reduces oil and wears longer. Application is easy, and you get the dual benefits of liquid and powder makeup. The latest craze in foundation is mineral makeup. With a handful of simple ingredients, mineral foundations are ideal for those with sensitive skin. The foundation is applied with a big makeup brush, layering the minerals for a “soft-focus” look. Regardless of the type or shade you choose, the first step to a flawless final look is Oro Gold products like 24K Collagen Renewal Cream and DMAE Lifting Concentrate Serum. I wish I would have read this years ago! I love these products! Since I used them I’ve been looking everywhere to buy and replace so excited!